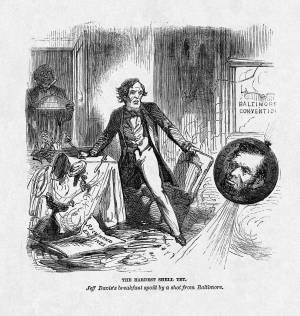 The cartoonist interprets the renomination of President Abraham Lincoln by the Republican National Convention in Baltimore as the Union's "Hardest Shell Yet" against the Confederacy. Jefferson Davis's breakfast is interrupted by the shell-imprinted with the face of Lincoln-shot through the window from the Baltimore convention. The Confederate president's domestic slave smiles in the doorway.